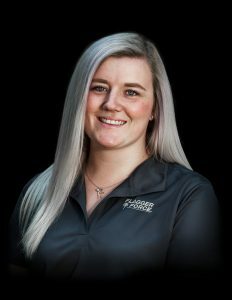 When Kyrsten Nave started out as a crew member for Flagger Force, she saw the opportunity to advance through the company path while attending college for her bachelor’s degree. Though she’s been with the company only two years, everyone who encounters her bubbly personality and professionalism is immediately impressed. 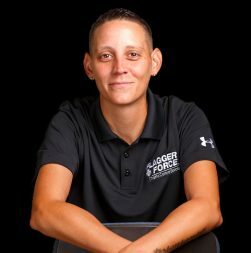 Flagger Force sat down with Kyrsten to hear her story and her insights on taking advantage of opportunities. Flagger Force: Hi, Kyrsten! Thank you for sitting down with us today. How long have you been with the company? Kyrsten Nave: I have been with Flagger Force for two years. I started in July 2015, after a friend referred me, and started as a crew member. I immediately saw the opportunity to advance—that was one of the reasons I was interested in joining the company. Flagger Force: Before you joined Flagger Force, what were you doing? Kyrsten Nave: I joined Flagger Force during my last semester of school. While in school, I would also waitress on the side during nights and weekends. I graduated from Carlow University in December 2015 with my bachelor’s degree in biology. I have a passion for animals and have a lot of pets at home—three dogs, three cats, six chinchillas, and a lot of reptiles. I love animals—they are my favorite thing in the world. Flagger Force: What was it like to start out as a crew member? Kyrsten Nave: It was different; I wasn’t used to it. Being a waitress, I was used to working indoors. In the field, every day was interesting—I met different people and saw different things. Overtime, I became an advanced crew leader, which I really enjoyed. Instead of assisting in setting up a site, I could lead the site and mentor others who were in the seat I was once in. I was a crew member for a while when school was in session, but once I graduated, I became an advanced crew leader. It was a lot easier to show up on the sites with the equipment I needed for the day. 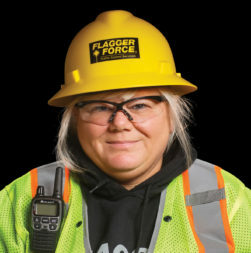 Flagger Force: What is your current role with Flagger Force? Kyrsten Nave: My official title is client specialist, but at this facility, we all work together with the calls that come in. I’ll help with various things, such as dispatching. I do know a lot of people in the field from when I worked out there, so it does make it easier for me to walk through questions that clients and employees may have about certain setups. Flagger Force: In your own words, what is it like working as an operations specialist? Kyrsten Nave: Most of the time, my job entails helping the clients figure out what they need and staying in communication with them. Our clients appreciate when we communicate, provide them our professional recommendations on how a safe setup should go, and get them home at the end of the day. Flagger Force: What was it like moving from working in the field to in the office? Kyrsten Nave: It was weird at first because I was now in a different facet of Flagger Force that I was unfamiliar with. Since joining the office, I have a higher understanding of why certain jobs are assigned the way they are and can provide people I know the insights I have gained. Flagger Force: What is a typical day like for you? Is there a typical day? Kyrsten Nave: Similar to working in the field, there is no typical day. Each call is a bit different than the ones from the previous day. Some days I will spend most of the morning dispatching and then switch to confirmations. Other days, I am working on emergency orders that take time to fill or helping our recruiter with new hires. There aren’t set times to when things happen either—when the clients call, we answer. Flagger Force: What is one of your favorite things about your job? Kyrsten Nave: I really like my coworkers. Days are a lot easier when you have a support team around you. We like to joke and have fun, while making sure the work gets done. I love that we have that type of environment because a lot of other places aren’t like that. Flagger Force: What made you interested in working for Flagger Force? Kyrsten Nave: The hours were really appealing to me. Going to school full-time and working was difficult, but luckily, I made this work for me. Thinking about my role now, the hours are still good for me. Sometimes my days are longer than others, but either way, I like how I can still enjoy my free time with my pets outside of work. Flagger Force: Have you always lived in the Pittsburgh area? Kyrsten Nave: Since I was seven, yes. I moved a bit when I was young, but eventually my mom and family settled here. I love the city, the traffic, and the people. I enjoy all aspects of Pittsburgh. Flagger Force: When you are not at Flagger Force, what are you doing? Kyrsten Nave: Well, I have my animals, but I spend a lot of my free time with my family. My days are busy, so to be able to relax with them is important. Sometimes we have bonfires or go to the movies. I’m so close to them, so it’s important to me to be able to see them. Flagger Force: What is something you are passionate about? Kyrsten Nave: Animals—obviously—but I do play in a softball league outside of work. I grew up playing softball, so nowadays I like to play as much as possible. Flagger Force: As you meet new employees, do you provide them any advice? Kyrsten Nave: I try to. I always tell them to dress appropriately when working in the field. You are out in weather conditions that change so quickly—it is safer to be prepared with extra PPE and to have your resources available. I also encourage them to refer to the Spacing Guide card in the field when they have questions. I think that helps in various ways, no matter who you are in the company. Who do you admire most? My grandfather, who is a World War II veteran. He has seen and done so much that I admire him for. He is 98 years old and has so many great memories, and I enjoy when he shares them with me. If you could meet anyone in history who would it be? Hands down, Steve Irwin. All the experiences he has had would be amazing to hear about. His kids are now doing the work he was doing, so they would be interesting to meet to. What’s the best piece of advice you’ve been given? Go for what you want. Don’t let anyone tell you that you can’t do something. Believe in yourself and make it happen. How would you describe yourself? Upbeat, funny, and driven. I try to always keep things positive and light.